As the Chamber continues to grow, so do the benefits that become available to our members. The following benefits and services are provided to all our members! The Lakes Area Chamber of Commerce is committed to promoting a high quality of life for local businesses and the entire community. The Chamber’s benefits, services and events are designed to help our members be active and engaged in their community, network with fellow business owners and build their businesses. It’s our goal to help you succeed. We invite you to join the Lakes Area Chamber and display your membership plaque with pride. Being an active member of the Lakes Area Chamber of Commerce helps improve your standing in the community. Many customers gain confidence that they are dealing with a reputable company when they see that the company they are considering doing business with has made the commitment to be involved in a local chamber and the community. We are proud to say, many of our member businesses have been a part of the Lakes Area Chamber of Commerce for 20+ years and some since the inception of the Chamber in 1950. Numerous networking events are offered every month to help you gain valuable business exposure. Members are invited to host and/or attend the 1st Friday Coffee Connect or the 3rd Thursday Coffee Connect at no additional cost. The once a month Spotlight Lunch offers a casual way to get to know fellow members over lunch at a local eatery while the Business & Brewz events provides the opportunity to meet and network after hours. On a quarterly basis, the Lakes Area Chamber of Commerce partners with several other local chambers to offer multi-chamber networking opportunities as well. The Chamber’s #1 requested piece of information is the Membership Directory & Buyer’s Guide. Your membership entitles you to two business listings in this publication, one alphabetical listing and another listing by your chosen category. The directory is available in both a print and digital edition. Additional display ads and categorical listings are available to highlight your business further, if you desire. The Chamber website contains a list of all member businesses and organizations. For companies that do not have their own website, this is an inexpensive way to have a presence on the Internet. The website also provides opportunities for Featured Business advertising, promoting your business with a Member 2 Member Discount, easy online event registration, the ability to promote your event on the Calendar of Events, as well as easy access to view upcoming Chamber and community events. The monthly Chamber E-Newsletter introduces new chamber members, promotes renewing member businesses, offers photos from recently hosted events and contains valuable information about upcoming chamber and community events and sponsorship opportunities. The E-Newsletter reaches 600+ area business people and for a nominal charge, members can advertise directly in the newsletter. The Member 2 Member Discount Program has been designed to encourage our members to patronize Chamber member businesses first. For no additional cost, your business information is listed on the website with your special discount or promotion offered to fellow chamber members. The Lakes Area Chamber of Commerce offers a discount program through Office Depot which helps our members increase their bottom line with “member only” savings on their purchases; streamline ordering with next day delivery; link their business account to their retail store; and conveniently order by fax, phone, Internet or retail store. There is no additional cost to participate in this program. Simply complete the registration form and start saving today! 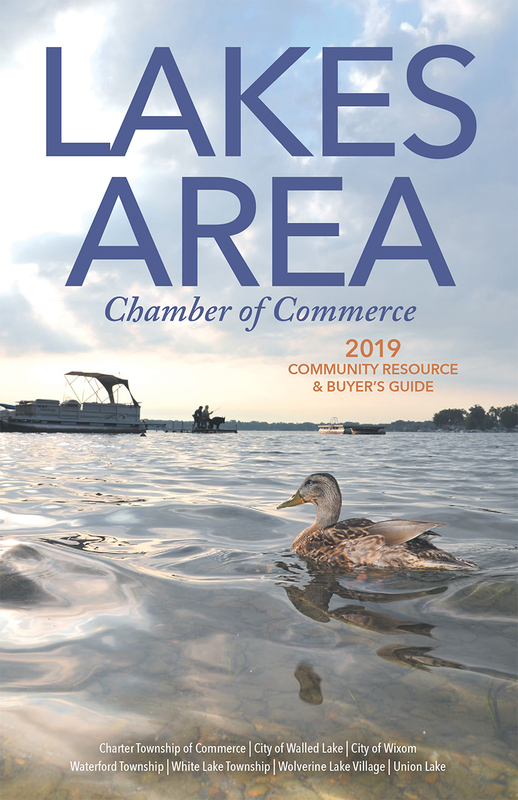 • Annual Membership Luncheon and “State of the Lakes” Address: Each March, representatives from the state, county and lakes area communities address the area economic outlook, status of projects underway, new development and other upcoming changes for the year. • Annual Golf Outing: The chamber organizes a spring golf outing each May which allows members the opportunity to mix business with pleasure as they spend a day on links. Great things happen on the golf course. • Annual Membership Breakfast & Awards Presentation: Each June, chamber members come together to recognize those that have made a difference in our communities and also acknowledge members celebrating anniversary milestones. • Annual Rockin’ Under the Stars: Each August the chamber organizes an outdoor summer concert at the Multi Lakes Conservation Facility. The event is fun for the whole family and allows area residents the opportunity to enjoy an evening of music with friends, family and neighbors. • Holiday Mixer: In early December, chamber members come together to celebrate the holiday season. A “hard networking & qualified referral sharing” team of Lakes Area Chamber of Commerce members whose primary goal is to develop strong relationships among its members for the consistent exchange of ideas, resources and referrals. Bi-weekly meetings are structured to provide a supportive system of giving and receiving business referrals. An annual supply fee of $25 helps to cover costs of these groups. Visit a meeting to see how it could benefit your business. The Lakes Area Chamber of Commerce offers various educational opportunities throughout the year. By utilizing the best experts we know (our members) the chamber facilitates a monthly education workshop at the chamber offices. Various topics are presented throughout the year and members are encouraged to contact the chamber if they would like to present a workshop. Other educational opportunities are organized throughout the year with several of our local chamber partners in which we combine networking & education. Check the Calendar of Events for a complete list of upcoming events. • Enjoy the chance to grow your business and meet new friends! Members can access Blue Cross/Blue Shield of Michigan plans through the Small Business Select program, which is available exclusively to Chamber members.